Here we suggest some of the steps you may wish to consider when developing approaches to building organisational digital capability. The focus is on supporting you to equip your organisation, your staff and your students to operate effectively in an increasingly digital world. Because each organisation differs in terms of size, priorities, structure, role composition and many other factors it is important to take the information and advice given in this guide to build a contextualised model appropriate to your needs. Case studies emerging from our building digital capability project show how several organisations have done just that, using both our own resources and those of others to develop an approach that works for them. We also summarise some of the lessons learned from case study participants in journeys towards digital capabilities (pdf). The advice has been divided into four practical groups of activities presented as steps for a variety of different stakeholders across the organisation and also highlights tools and resources to support you. 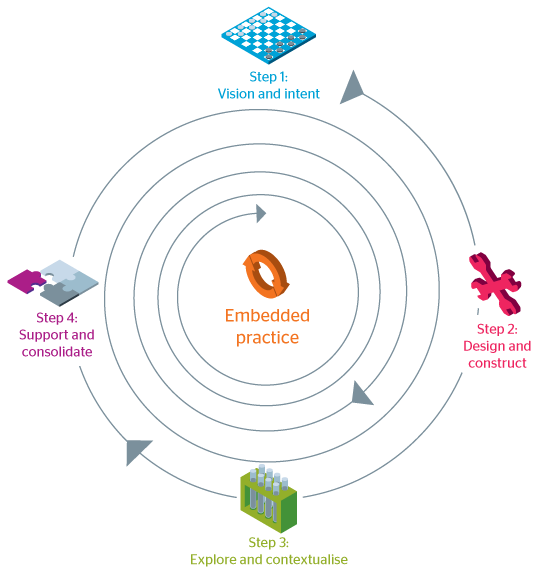 This version of our model for strategic steps towards organisational digital capability shows the four basic steps. You can download our more detailed action-focused poster (pdf) or an outcome-focused model (pdf). Establish the vision and intent that will drive forward your focus on developing your organisation’s digital capability. Clearly articulated benefits for all stakeholders with evidence-based examples. Design and construct approaches and support mechanisms to bring the vision and intent established in step one to life. Work with teams to explore what digital capabilities are appropriate for specific teams and build a contextualised implementation plan. Support and consolidate the development of digital capabilities across the organisation. You can also read our quick guide on how to shape your digital strategy.